Virtual Water Testing Lab - AP Environmental Science! 1. What contaminants were found in the surface water samples? 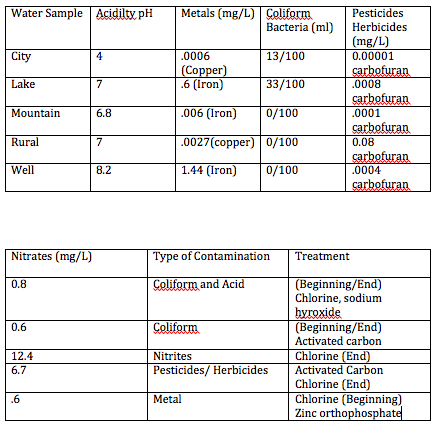 What contaminants were found in the groundwater samples? Contaminants found in surface water samples contained metals, coliform, nitrites and pesticides/herbicides.. Contaminants found in groundwater are coliform and acid. 2. Why might groundwater and surface water have different contaminants? Surface water could have different contaminants because it can be exposed to things like nitrogen/phosphorus and can be exposed to sprays like pesticides and herbicides, while groundwater cannot be touched by these things because it is covered up underground. 3. Generally, farmers do not farm and industries do not build factories on the sides of mountains in remote wilderness areas. These areas are usually not highly populated by people. What might explain the high nitrate level in the mountain water in this activity? There might be the buildup of bacteria, which causes the nitrogen cycle. The nitrogen cycle creates the nitrites. 4. What is pH level, what are its characteristics and how does it contribute to pollution? What chemicals are used in treating low pH levels? pH level tracks the acidity of the water. If the pH is 7, it is neutral. If it is 0-6 then it is acidic. If the pH is more than 7 then the water is basic. pH can contribute to pollution because it can magnify the effect of other contaminants, meaning that it can make the pollutants stronger. Chemicals used in treating low pH are sodium hydroxides and any hydroxides that would neutralize the positive hydrogen ions. 5. Water in an old building, tested recently, showed high copper and iron content, and low pH levels. A water reading taken 20 years before showed low pH levels, but only minimal traces of copper and iron. If none of the new buildings on the same street showed signs of metallic contaminants, but all reported lower than normal pH readings, how might these readings be explained? The older buildings have older pipes. When the pipes get older, they get rusty and corroded. The rusty and corroded pipes release the cooper and iron contaminants into the water supply of the old building. The newer buildings have newer pipes, so there is no copper or iron in trace because the pipes have not rusted or corroded due to age. 1. What are four types of water pollution? Define each. 2. Which fish species are the least tolerant of water pollution? Which species are the most tolerant? How do you arrive at your conclusion? Trout is the least tolerant. I arrived at this conclusion because they require a specific temperature (40-45 celcius) and well-oxygenated waters. Compare this to the other fish that can survive with low oxygen, shallow waters or in any temperature. The most tolerant species is the catfish. I arrived at this conclusion because it can survive in any condition the other fish species can't, including low oxygen and high carbon dioxide, acidity, and pollutant levels. 3. Which invertebrates are the least tolerant of water pollution? Which species are the most tolerant? How do you arrive at your conclusion? Stonefly nymphs are the least tolerant, because they require clean water and well-oxygenated water, while the rest can live in low oxygen waters. Midge larvae is the most tolerant, because they are able to live in any condition as long as there is a food supply. 4. What might a high level of bacteria indicate about DO levels? What is the relationship between bacteria and water pollution? Bacteria decompose and take up oxygen when it is decomposed. If there is a lot of bacteria in the water, when they all eventually decompose they will take up all the oxygen. High levels of bacteria indicated that the DO levels would be low. 5. Based on the lab results, what conclusion can be drawn about each site? Which river was the most polluted? How did you arrive at your conclusion? The conclusion that can be drawn about each site, is that in site #1 fish can only live in the Spring and Winter. In site #2, fish can only live in Spring, Summer, Autumn and Winter. In site # 3 Spring, Autumn and Winter is where the species can live in. The river that is most polluted is site #1, because the fish that can survive in this site are the ones that like the water with little to no oxygen and shallow waters. No other fish can be found in site #1. It is either carp, gar and catfish are found or there is no fish at all.